Organize more than one project in the same folder. Sort information within one project folder by separating letter size documents among three sections, which are created by dividers. 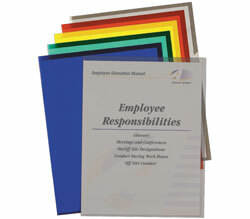 Folders allow for individuals to instantly have quicker access to documents since they are better organized. Folders are clear with clear dividers. For 8 1/2 x 11 materials. 25/BX.